Riding high on the success of its affordable handsets, Motorola Mobility today unveiled the second generation of its popular Moto G and Moto X in India in an exclusive partnership with homegrown e-tailer Flipkart. NEW DELHI: Riding high on the success of its affordable handsets, Motorola Mobility today unveiled the second generation of its popular Moto G and Moto X in India in an exclusive partnership with homegrown e-tailer Flipkart. The US-based firm, which has sold 1.6 million units of Moto E, G and X since February, is betting on the new version to help it ramp up sales in the fiercely competitive Indian smartphone market. "Partnering with Flipkart, we had launched Moto G a few months ago, followed by Moto X and Moto E, all of which have received tremendous response in India. Now, we are bringing in a new generation with better features and at an attractive price," Motorola Mobility India General Manager Amit Boni told reporters here. 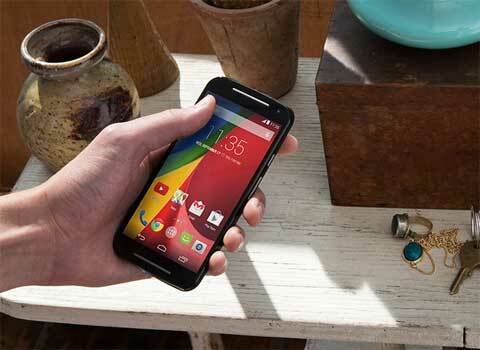 Moto G will be priced at Rs 12,999 (16 GB), which is cheaper by Rs 1,000 compared to the previous generation. Along with the Moto 360 smartwatch, Motorola will make the Moto X available later this month. The pricing of both the devices will be announced later. Motorola claims to have over 5 per cent share of the India smartphone market.According to research firm IDC, smartphone sales in the country grew almost three-fold to over 44 million in 2013, buoyed by affordable devices made by local firms. In the second quarter of 2014, 18.42 million smartphones were shipped in India. Samsung is the leader with a 29 per cent market share, followed by Micromax (18 per cent). The smartphone category is witnessing intense competition, especially in the affordable (sub USD 100) segment. Last week, Firefox (in partnership with Spice and Intex) had launched two new handsets, priced below Rs 2,300, aimed at those looking to upgrade from feature phones to smartphones. Google is also expected to launch its much-awaited sub-USD 100 (around Rs 6,000) smartphones in India on September 15, which will further intensify competition in the booming multi-billion dollar smart devices market here. Flipkart Vice President Retail and Head Strategic Brand Alliances Michael Adnani said 1.6 million units of Moto E, G and X have already been sold on Flipkart. "Moto E accounts for the bulk. We are confident that we will see similar response for the new devices as well," he added. Asked whether the company will discontinue the previous generation, Boni said it will be gradually phased out. The new Moto G has a 5-inch screen, 1.2 Ghz quad core processor, Android KitKat OS, 1GB RAM, 8MP rear and 2MP front camera, expandable memory up to 32GB and 2,070 mAh battery. The Moto E will feature 5.2-inch screen, 2.5 GHz quad core processor, 2 GB RAM, 16GB memory, 13MP (rear) and 2MP (front) camera and 2300 mAh battery. Talking about the smartwatch, Motorola Mobility Senior Vice President Product Management Charlie Tritscler said the market is new and growing. "Globally, wearable is a new trend and it is picking up. Moto 360 is trendy and smart. We expect it to do well here as well," he added.